The Community Emergency Response Team (CERT) program trains citizens to prepare for emergency situations in their communities. 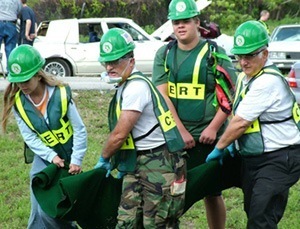 When disaster strikes, CERT members give critical support to first responders, provide assistance to victims, and organize spontaneous volunteers at a disaster site. CERT members also help with non-emergency projects that improve the safety of the community. Our CERT Kits are specifically designed to supply members with the equipment they need to carry out their response tasks. ANSI CLASS 2 - People in situations involving poor visibility and/or heavy trafic should wear a high-visibility ANSI Class 2 Safety Vest which has at least 201 square inches of reflective tape that is 2 inches in diameter. This Community Emergency Response Team (CERT) Baseball Hat is adjustable and has CERT lettering on the front. This 2" x 3" Embroidered CERT Patch is perfect to sew on any item. This patch is in the form of the official CERT Logo.